(April 24, 2017) -- Thousands of Roadrunners will reach a milestone in their educational journey this month as they walk the stage at one of three UTSA spring Commencement ceremonies. The ceremonies will take place Saturday, May 13 and Sunday, May 14 at the Alamodome. More than 3,500 undergraduate students, 880 master's students and 55 doctoral students are eligible to attend the ceremonies. While they share a common bond as members of the Roadrunner family, they each have a unique story of academic achievement. One outstanding graduate is UTSA psychology major Miguel Gonzalez. Now in his mid-30s, the non-traditional Honors College student worked many jobs before dedicating to his education and completing his degree at UTSA. Next, the Terry Scholar will pursue his master's at UTSA. "What propelled me the most at UTSA are the opportunities I received through the Terry Transfer Scholarship, conducting research, and through the Honors College," said Gonzalez. "These opportunities helped me keep my focus on my academics." Jasmine King will graduate from UTSA with her bachelor's in biomedical engineering. She transferred to UTSA for its academic opportunities. King says she was also attracted to the university's diversity. "My professors are very involved with their students. They've embraced diversity from the first day I stepped foot on campus. That's how it will be in the real world and with professional careers," King said. The National Science Foundation Graduate Research Fellow will build on her UTSA education this fall when she pursues her Ph.D. at the joint UC Berkeley/UC San Francisco Graduate Program in Bioengineering. First-generation finance major Freddie Cuellar has already landed a job at Vantage Bank Texas once he graduates. "The professors in the UTSA College of Business not only focused on education and assuring that we learned the materials, but I also learned professionalism, leadership, networking and public speaking," Cuellar said. "I had opportunities to step out of my comfort zone and challenge myself and better prepare myself for a career in banking." Hear more UTSA student success stories on the UTSA Commencement website. 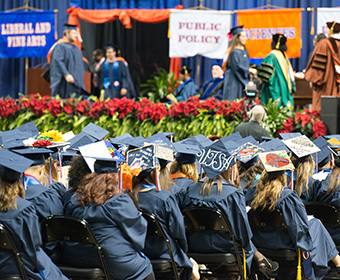 UTSA's first spring Commencement ceremony begins at 10 a.m., May 13 and honors graduates from the College of Liberal and Fine Arts, the College of Public Policy and University College. U.S Senator José Menéndez will deliver the keynote address. Students who are earning a degree from the College of Architecture, Construction and Planning, College of Business and College of Engineering will walk the stage on May 13 at 4 p.m. The keynote speaker for the afternoon ceremony is U.S. Representative Will Hurd. The entrepreneur has long been an advocate of UTSA's cybersecurity program. The third ceremony, scheduled at 2 p.m. on May 14, will recognize graduates from the College of Education and Human Development and the College of Sciences. Juliet Garcia, senior advisor to the Chancellor of the University of Texas System for community, national and global engagement, will address graduates in this last ceremony. All graduates are advised to arrive two hours prior to their ceremony for check-in, located on the ground level of the Alamodome. For family members who can't attend Commencement, they can watch all three ceremonies on the livestream. UTSA graduates, family members and friends are also encouraged to share their stories on social media using #UTSA and #UTSAgrad17.